Looking for the Wednesday Wandering? Back up one entry and join me in “The Mystery of the Anomalous Cucurbita.” Then come back here and let Alan elucidate the question of what an English college tutor actually does. JANE: I think you folks use the term “tutor” very differently than we do. Here, a tutor is a person who helps a student who needs a bit of extra coaching in an academic area. When I was having trouble with Spanish, I went for extra “tutoring” each week. However, I believe the post is much more formal and central to your educational system. Can you explain? ALAN: A tutor is a member of the university staff who holds tutorials. That’s not as silly as it sounds – students in any one year are divided into small groups of half a dozen or so who meet regularly with their tutor. Because of the small size of the group, the tutor can give them lots of individual attention. The tutors give assignments and hold discussions and generally explore points of interest. It’s an interesting structure which is both formal (in the sense that the meetings are regular and work is assigned) and informal (in the sense that the plan the tutor has in mind may be completely discarded as a result of something a student wants to ask about). JANE: That sounds rather lovely. ALAN: The idea of extra tuition is quite foreign to me. By the time you reach university, you really sink or swim on your own. If you feel you are having trouble with a subject, well – that’s what libraries are for. And if you can’t keep up, that’s a problem you largely have to deal with yourself. JANE: I think our college students also sink or swim on their own – maybe far more than your students ever do. We don’t have a tutor to hold our hands on a regular basis. Our students attend classes, then deal with individual instructors at their own initiative. There is no one assigned to give you that one-on-one attention. Therefore, if you can’t keep up, then you need to find help. Really, I think having a formal tutor assigned to answer questions would be a wonderful luxury. ALAN: I always found it very valuable when I was a student. And it also had its amusing moments. I vividly remember one tutorial a few days after a lecture where we’d been introduced to some rather advanced ideas which we were finding more than a little puzzling. So one of our group asked the tutor about it. Then he picked up the phone and rang the lecturer who’d introduced us to the topic and asked him to pop down to the office to see if he could help us. JANE: Oh! Wonderful. I really admire your tutor for having the courage to admit he didn’t know and then get help for all of you. ALAN: So if you don’t have tutorials, how are assignments handed out and marked? Does the person taking the class (the lecturer in my terminology) do that? I find that a hard concept to grasp as well. Any given lecture at my university could have had a hundred or more attendees. That’s far too many for one person to contend with in any administrative sense. 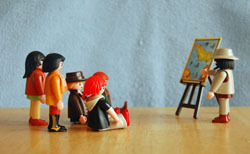 Perhaps our tutorials are closer in concept to your classes, and perhaps your class sizes are smaller than our lectures. Would that be a reasonable assumption? I suspect that it might have been the large size of the audience at lectures that led to the development of the tutorial system in the first place. Like so many things we’ve discussed, the answer is a bit more complex than you might imagine. Let me start with class size, then double back to how assignments are handed out. ALAN: Sounds good to me. JANE: Class sizes vary with subject matter and how advanced the class is. In some areas – like sciences – introductory classes are often quite large. However, in other subject areas – like literature – the classes are often smaller in order to permit discussion. However, I don’t think even these smaller introductory classes get as small as your British-style tutorial groups. Many will have forty or so students. Science classes often have associated “labs,” but someone else will have to tell you about them, since I haven’t had a “lab” class since high school. ALAN: Labs are a completely different kettle of fish. I remember being very jealous of my non-science student friends. They had most afternoons free while my afternoons were filled up with labs. Humph! JANE: As the subject matter becomes more sophisticated, however, the class size can get quite small. Often these are called “seminars” and might not have more than eight or ten students. Sometimes a class with small enrollment becomes seminar-like by default. I remember with great fondness one I took about the Faust motif in European literature. We did everything from ur-Faust texts to James Blish – and ended by going to see a part of Goethe’s Faust performed in the Village. In graduate school, a student might even convince a professor to do an independant study focusing tightly on one small area. I did a couple of these and loved them. One was on Yeats’s plays. Another was on the works of D.H. Lawrence – this one led directly to my doctoral dissertation. ALAN: Sounds like fun. I wish I could have done something like that, but once I’d chosen to study a science, all the arts subjects vanished from my curriculum. Now I have a question for you. From what I’ve read about the British educational systems, you have special “level” exams. Can you fill me in on these? ALAN: Now there’s a complicated subject. We’ll talk about it next time. This entry was posted on August 9, 2012 at 1:00 am and is filed under Thursday Tangents. You can follow any responses to this entry through the RSS 2.0 feed. You can leave a response, or trackback from your own site. Interesting. I worked my way through grad school in the U.S. largely as a teaching assistant, which meant that I had a group of up to 24 students that I taught in labs and discussion sections. The professor or lecturer taught the lecture, organized the labs and discussion sections, but I was responsible for implementing the latter two. In some large classes, there is even a lab manager who gets that material together. In botany, this often means making sure that the plants needed are grown and ready for the lab, which gets a bit complicated. I also held office hours, where students occasionally came to my office for extra help, typically before tests, and sometimes right after they realized they were setting up to fail. The system works (in theory anyway) because it gives the grad student a lot of teaching experience, and also because the grad students are closer to the undergrads taking the course, so they have a better understanding of the problems the students are facing, so they can sometimes explain the material in ways the students can get. The problem, of course, is the TAs are teachers in training, and sometimes they aren’t teaching in their own department. As I understand it, the system came about during the 1960s as a response to the swell of baby boomers hitting college. Big colleges simply couldn’t afford the professors to teach them all, so they started bringing in more grad students to meet demand. The ultimate result is that most of the sciences produce a large surplus of PhDs, most of whom have to do something other than join academia. In my undergrad days (in Canada, as an Arts major) most courses, especially in first- and second-year, tended to be split into large lecture sections (especially in breadth* courses) of ~2 hours/week plus a 1 hour weekly seminar. All students would attend the weekly lecture(s) (sometimes two one-hour sections, sometimes one two-hour section) taught by a (usually adjunct or assistant in the lower years) professor (sometimes two professors would each teach one one-hour section), then break into smaller groups of 10-20 for the weekly seminar. Seminars generally focused on one particular element of that week’s lecture, and were supervised by i/n/d/en/tu/r/e/d s/e/r/v/a/n/t/s teaching assistants (generally grad students) – lab sections for courses that required them generally followed the same pattern of 2 hours of lecture and 1 hour of lab. S/e/r/f/s teaching assistants were usually tasked with grading lab work, papers, exams, and so on under the w/h/i/p/h/a/n/d kindly supervision of the professor in charge of the course and also served as the first line of defense keeping professors from having their office hours invaded by confused first-years. As you moved into the more advanced and specialized courses in third and fourth year classes tended to get much smaller and the lecture/seminar distinction tended to fade, as many classes only had 15 or 20 people enrolled. *Most Canadian universities require a certain number of courses outside your core discipline/chosen major, including at least one course each in science, humanities, and social science, regardless of major. This tends to lead to very high enrollment in first year/introductory courses perceived to be “easy” as people get their obligatory social science/humanities/science credits out of the way. It isn’t unusual for Psych 100, for example, to require multiple lecture sections since many universities don’t have a single lecture hall that can hold 1500 students. Thanks for the added details — especially as they come from different systems. I was in liberal arts, so the role of lab assistants has always been a bit of a mystery to me. Interesting, isn’t it, how many people take Psych? I think we all have a desire to try and figure out what makes the human animal work, no matter what discipline we choose.